Using the Belgian Chocolate Mousse White Chocolate base, we have added semi dried cranberries, Australian currants, cinnamon, nutmeg and orange oil. All the traditional flavours of Christmas pudding in a white chocolate dessert. Can be made using whipped cream, ricotta cheese or Greek style yoghurt. Serve chilled as a mousse or frozen, and then served as a semi fredo pudding surrounded by summer berries for a unique Australian Christmas pudding. See the Christmas Pudding video on this website for full details on how to make this spectacular summer Christmas Pudding. An outstanding option for a hot Christmas day. 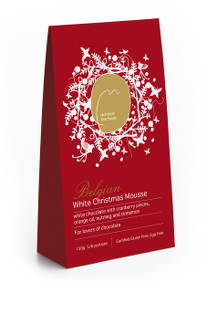 1x 150g pack will make approximately 700ml enough for 6 adults when served with a little fruit and a biscuit garnish. Available in 150g retail, 3kg and 5kg bags foodservice. 1 x 150g package will make approximately 700ml of mousse. Enough for 6 adults when serving with some fruit and a biscuit to garnish. 1 x 3kg bag will make approximately 15 litres of mousse. Enough for 150 x 100ml portions when serving with some fruit and a biscuit to garnish. 1 x 5kg bag will make approximately 25 litres of mousse. Enough for 250 x 100ml portions when serving with some fruit and a biscuit to garnish. SKU: N/A. Category: Belgian Chocolate Mousse. Tags: Chocolate, Christmas, delicious, desert, food, Gift, pudding, white, yum.